SEOUL, Aug. 21 (Yonhap) — Samsung Electronics Co. is set to start a global war of high-end smartphones this fall by showcasing a new flagship model later this week, industry watchers said Monday. 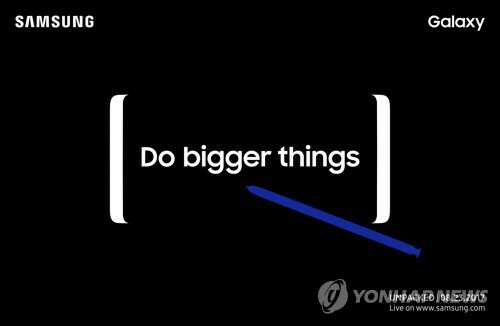 The South Korean tech giant will showcase the presumed Galaxy Note 8 in New York on Wednesday, with its smaller rival LG Electronics Inc. also planning to unveil the LG V30 at end-August. U.S. tech giant Apple Inc. is also expected to introduce a new iPhone next month. The presumed Galaxy Note 8 is a successor of the ill-fated Galaxy Note 7, whose production was suspended last year due to a battery problem. Industry watchers expect the new phablet will come with what it calls an Infinity Display that minimizes bezels, which was adopted by the Galaxy S8. The display size is estimated at 6.3 inches, slightly larger than the 6.2-inch Galaxy S8 Plus released earlier. The Galaxy Note 8 is expected to become Samsung’s first flagship smartphone to boast a dual-lens camera that also features double zoom. The resolution of the wide-angle lens stands at 12 megapixels, while that of telephoto lens is at 13 megapixels. It also supports Optical Image Stabilization, with the aperture standing at F1.7 — the same as the Galaxy S8 models. The device is expected to have a fingerprint reader on the back, industry watchers added. Apple is also expected to celebrate the 10th anniversary of iPhones by showcasing the iPhone 7s, iPhone 7s Plus and iPhone 8 later this year. Compared with previous iPhone models that adopted liquid crystal display (LCD), the new models are expected to come with organic light-emitting diode (OLED) displays. Sources said Apple may eliminate the home button on the front. LG Electronics is also set to introduce the LG V30 in Berlin on Aug. 31. Compared with other rivals, the company has been releasing various teasers of the device in an apparent bid to grab the market’s attention. LG said the V30 adopted an OLED display with an 18:9 ratio. The size of the display stands at 6 inches, slightly larger than the 5.7-inch LG V20 released last year. The company claimed it reduced the bezels at the top and bottom by 20 percent and 50 percent, respectively. Among others, LG emphasized that the V30 smartphone comes with a top-notch camera with an F1.6 aperture. A lower number in aperture indicates that a camera is capable of gathering more light, leading to more vivid photos and videos. LG added it adopted the Crystal Clear Lens for the rear camera to provide users with optimized color. The company said such glass-based material will allow the camera to capture more details of objects compared with other plastic-based lens. Industry watchers said Samsung and LG will start sales of their new flagships Sept. 15. As Apple is widely anticipated to showcase the new iPhone in September, industry watchers said the full-fledged battle among high-end smartphones will begin in late September.